The tree with the purple flowers that is widely grown in Australia is the Jacaranda Tree. They flower in spring and make great shade trees. However it is not only the purple variety that is available, a white flowering Jacaranda ‘White Christmas’ is also available. These are a medium to large sized tree, fast growing and reaching a height of around 10 – 15 metres over time. It will form a crown of similar size and grows well in a range of climate zones from tropical through to cool temperate zones. 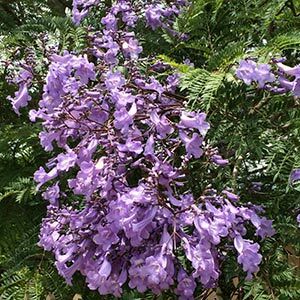 A flowering Jacaranda tree growing in an open area is a wonderful sight, masses of purple flowers over 6 – 8 weeks. And this is one the reasons that Australians have adopted it so readily. It is a tree that has been grow in Australia for over 150 years, and is used as a feature tree, as well as a street tree, from Queensland right through New South Wales to as far south as Melbourne, Adelaide and Perth. Also grown as a shade tree, a Jacaranda tree does require appropriate space for two reasons. It looks at its best when the crown can fully develop, and at maturity the crown can reach a spread of 10 metres. This is also a tree with a very vigorous root system and it should be planted well away from sewerage lines, water pipes and drains. It is also best planted away from pathways as the root system can push up and damage paved areas. Growth rate is slower in cooler climates, flowering can also be inhibited in very cold climates. In cooler climates you might consider Aesculus x Carnea, with attractive red flowers. Height – They will reach 10m to 15 metres in height. Growth Rate – Jacaranda tree growth rate is medium to fast once established. Flower Color – Purple to Blue. – Jacaranda mimosifolia ‘White Christmas’ is rare white flowering form. Propagation – Seed or Cuttings. 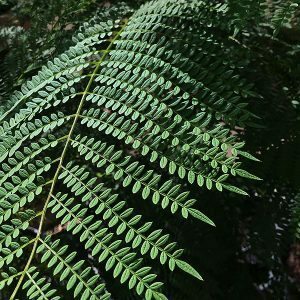 Common names – Blue Jacaranda. Root system – Vigorous, should be planted away from drains and paved areas. As long as the soil is well drained and is not subjected to sever frosts in its formative years this is a tree that is easy care. 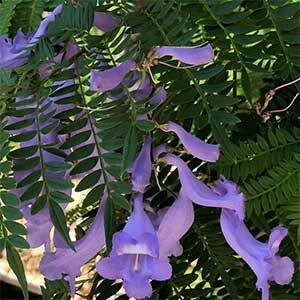 Once established the Jacaranda tree is relatively drought tolerant and is best grown in full sun. Overwatering can be an issue especially with newly planted trees. The soil should be allowed to dry partially between watering. Formative pruning can be carried out early on to establish a strong single trunk. Old dead and damaged wood should be pruned back. In some cases the canopy is thinned to reduce the weight of the tree and encourage better flower production. Over-pruning can cause failure to flower until the tree recovers. With a tendency to sucker, the root system is best left undisturbed. Any suckers should be pruned back as they appear. If planted in good soil, a Jacaranda tree will require little to no fertiliser once established. We suggest a good layer of mulch right to the drip line of the tree to eliminate the need for mowing and to help retain moisture in summer. In wet soils, plant the tree on a raised or ‘hilled up’ area to improve drainage.
. Due to the reasonably shallow, yet vigorous root system Jacaranda trees are not suited to growing in pots. The extensive root system of Jacaranda trees can cause problems with paving as well a drainage and sewer lines. The trees are naturally shallow rooted, damage by digging or mowing can cause fungal problems. Once Jacaranda trees mature, the weight can cause the tree to split. Pruning is not recommended as this causes long soft water shoots which easily break away. Formative pruning of young plants is carried out in nurseries. The masses of flowers that fall onto the ground can cause little problems. These are a fast growing tree in good conditions. Remedial pruning will prolong the life of the tree which can be 75 years. One tree growing in Casino NSW is nearly 100 years old. Jacaranda tree are grown both from seed as well as being grafted. From seed they can take 7 – 10 years to flowers, grafted trees will usually flower within 2 – 3 years. If you happen to be in Sydney in spring, it could be worth making a trip to McDougall Street in Kirribilli to see a tunnel of Jacarandas in full flower.